Welcome to the PlayerUnknown's BattleGrounds tournament creation guide! You'll see it's very easy, all you have to do is follow these steps! From your Organizer Dashboard, create a new Toornament on PUBG! If you are new to the platform, you should read this Starter Guide that will explain the basics to you. First step once your tournament is created is to set the Match Format settings, under the "Settings" -> "Match" menu. The Fixed Games (Advanced) will be selected by default, with a standard ruleset. Feel free to change the values to the ones your tournament is going to use at the bottom of the settings, but do not change the checkboxes and options, unless you know what you are doing! Thanks to the options enabled by default, you will only have to enter Rank & Kills for each game, and all will be automatic from here. With up to 100 players per match, PUBG needs a special kind of match, available in the FFA Stages, containing both the Simple Stage and Bracket-type FFA Stages. Create the one you need in the Structure menu. Name your stage, set its size and settings and you are good to go. With a lot of potential participants, we suggest you open your Registrations, so your participants can register themselves. Custom Fields are here if you need them to provide you with more information, like their in-game name or nationality. When you publish your tournament, it becomes visible on the platform and the mobile app, doubling the chances that people will find it to participate! Feel free to scout our Share category, it's filled with tips and guides on how to increase your reach and have a maximum of participants and viewers! Players will then start to register, and the next step is validating them. They will then become effective participants in your tournament, and you will be able to place them in the match(es) you created. 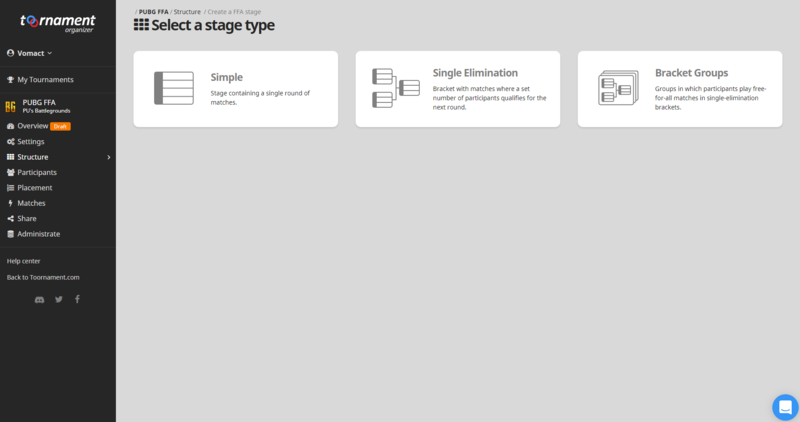 The Placement works just like for any other stage type, and should be a pretty straight-forward process. 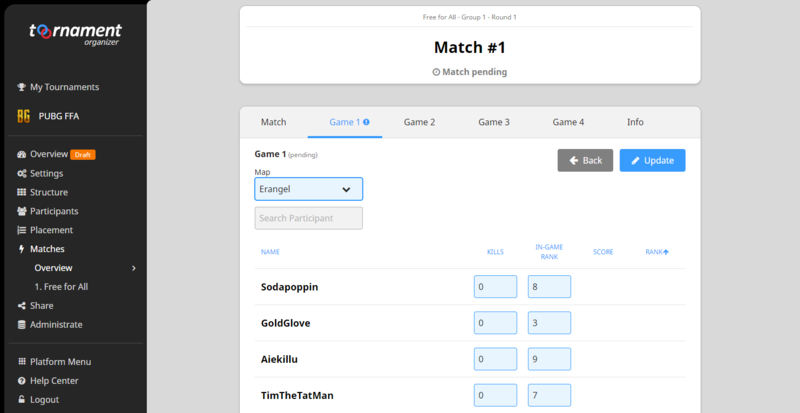 Once a match is under way, or over, head to "Matches" -> "Name of your Simple stage") and open it to start entering the results of the game. Every time you save the information with new ones, the ranking and display are automatically updated, both on the Organizer Dashboard and the public pages of the tournament. Your PUBG tournament is now running, and all that's left to do is determine the best survivor! You may want to create a more complex structure, with more than one match, and qualifying stages or anything. In that case, simply create more Simple Stages, place the needed participants in it, and have them play! If you wish, we also have an open and free API to unlock some pretty awesome improvements to your video and/or stream production. You may also use it for different applications, such as this infographics for the Just Dance World Cup.